Matt Torra went eight innings allowing only 1 baserunner (a walk) in the 7th and gave up just one infield hit in the 8th. A brilliant bit of pitching. He was followed by Cesar Ramos who gave up one hit, then earned the first save of his eight years of professional baseball. Together they set the stage for breaking the Bulls’ long, long, long losing streak and won Bulls’ first shutout of the season. To win, of course, the Bulls had to get at least one run, which they didn’t do until the 8th inning. Sean O’Malley drew a walk, scooted off to second base on a wild pitch, and then scored on a Jesus Feliciano double. This has been a difficult road. Kyle Hudson’s single at the top of the 3rd inning was the first hit of any kind in more than 14 innings. It took a couple of brilliant plays by shortstop O’Malley and second baseman Reid Brignac to pull it off. Second baseman Reid Brignac? There’s another mini-story. Will Rhymes was so upset being called out when he thought he beat a throw to first 6th he managed to get himself thrown out of the game. Reid Brignac was the only infielder on the bench, so he was in. I think Rhymes was the first ejection of a Bull this year. Which brings up another mini-story. Stephen Vogt was the DH for the game and Craig Albernaz was catching. Vogt went out to warm up Ramos while Torra was pitching, then switched off with Albernaz so he could go to bat in the 8th. About that bench. Ain't hardly anybody there. Brandon Guyer went on the DL. According to broadcaster Patrick Kinas, big changes are coming for the pitching crew. Alexander Torres has been moved to the bullpen. Lance Pendleton makes his first start tomorrow. Jim Paduch will be here tomorrow as well and will go into the starting rotation. Torres is reportedly not upset at the change. Something clearly needed to be done. Over at Rays Prospects, BurGi has a spectacular analysis of all the pitchers in the Rays system. A swimming pool for stats folks to dive into. The Rays have done the deal with Hideki Matsui. He should be showing up in Durham in time for his 38th birthday. Setting up the trivia question: Who is the oldest player to put on a AAA Bulls uniform? Jose Lobaton, who has spent a lot of time in a Bulls uniform, may be coming through on a rehab assignment. It’ll be nice to see him in the dugout again. This is a really simple stat with some interesting results. How many pitches are thrown per out? The fewer pitches, the more "efficient" you are. Matt Torra got through eight innings today with just 89 pitches. That's spectacular efficiency. Correction: In the chart it shows Alex Cobb only pitching 2⅓ innings. It should have read 28⅓ innings. PE computation, however, is accurate. At 107 pitches, the Indians’ Justin Wilson faced only 23 Bulls batters, none got a hit and he walked only two (Jeff Salazar and Kyle Hudson). Porcine Jose Diaz (a former Montgomery Biscuit) came in and got two outs. Doug Slaten came in (again) and got the last three outs. Bulls fans had the good grace to give Wilson the ovation he deserved and a good-natured booing to Indians manager Dean Treanor for pulling Wilson from the game. For Bulls fans, the real rub was that Bulls pitching had done a really good job. Alex Cobb did just fine through 6⅓ innings and Dane De La Rosa had his best outing of the year to finish out the game. The hitters just couldn’t figure Wilson out. I’m a baseball fan and I have to tell you that it was a thrill to be in the park when a no-hitter was pitched. Yes, it’s too bad the losing team was the Bulls, but you have to give the Indians their due. Great pitching, solid fielding, and just enough hitting to win. A careful reader notes that in addition to the 8 out of 9 batters in Saturday’s (and Sunday’s) lineup being left-handers, another lefty on the field was Wool E. Bull. As you'd expect, the Bulls ERAs aren't very impressive. 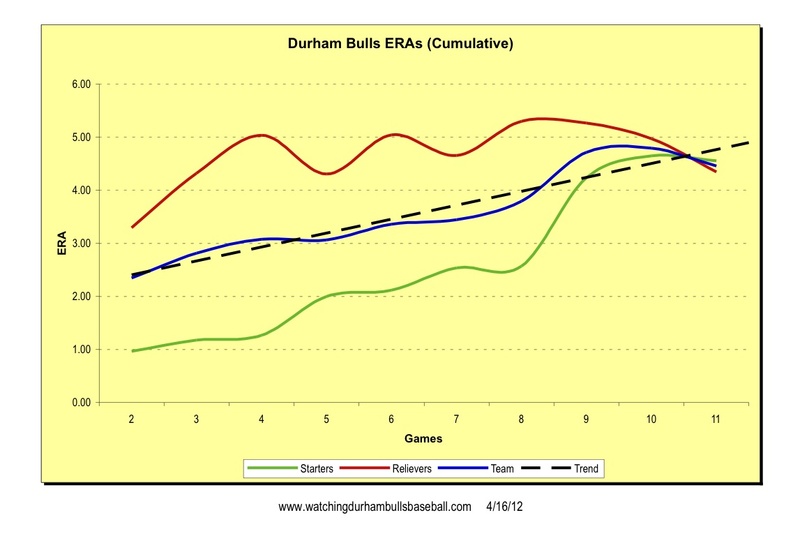 In fact, the team ERA (5.91) is the worst in the International League a full run behind Louisville (4.89). I went up to the top of the Blue Monster to watch the 9th inning Saturday evening. That location gives you a unique perspective on the game. I recommend it for an inning or two every now and then. From there you can look directly down on the visiting team bullpen. While Cesar Ramos was striking out the side (every batter struck out looking) I watched Indianapolis closer left-hander Doug Slaten warm up. I don’t follow Pittsburg so I can’t tell you why he’s not pitching there, but I can tell you that from the Blue Monster you have one heck of a look at what he can do. Impressive. His fastball was very close to the inside (for a left-handed batter) edge of the plate. His breaking ball started in the same place, but had a nasty away and down break. Beautiful to watch from above. Too bad he’s pitching for the Indians. 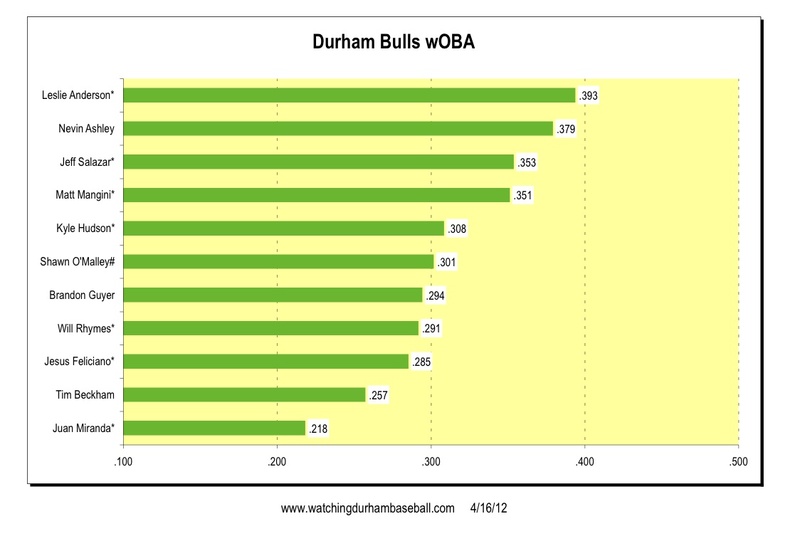 Which brings me to my point: Durham had 8 left-handed batters in the lineup last night. The Rays are famous for their platoon approach to the game, but that’s only for the Rays. No platoon down here in Durham. There are only three right handers on the roster (if you count switch hitter O’Malley as a right-hander), and only Albernaz was in the lineup last night. Slaten had no problem at all with the three Bulls he faced and the game was quickly over. Nevertheless, Bulls fans can take some solace even in this fifth shutout, and 12th in a row loss. For the first time in a while, the pitching was pretty solid. Archer was much improved from his last time out. If the Bulls had had what they’ve had in every season I’ve watched them, a speedy centerfielder, they might have gotten out of the 2nd inning unscathed. But we don’t have that. The Indians do. It was a treat to see their Starling Marte chase the ball down. Reminded me of Desmond Jennings or Justin Ruggiano or Fernando Perez or, heck, even John Matulia, who didn’t let many balls get past them out there. "It’s tough to come from behind,“ Montoyo said. "We don’t have that kind of team to get a three-run home run this season." Doc Watson is back playing "Take Me Out to the Ballgame"! Hooray! I thought the "Running of the Bull" gimmick Friday night was pretty cute. Video board information is much improved. Lineup. Some ingame stats. Opposing pitchers. Thanks! I could not bring myself to write about last night’s disaster. I’ll put up the basic links later on. Those of you who were at the game saw Nevin Ashley in severe pain when he was hit on his throwing hand by a deflected pitch in the 3rd inning. That was what led to that extraordinary bit of lineup shuffling: Left fielder Stephen Vogt ran in to put on his catching gear, second baseman Sean O’Malley ran out to left field, third baseman Will Rhymes jogged over to second base, and Matt Mangini off the bench to third base. It turns out that the injury to Ashely’s hand is serious and he’s been place on the disabled list. Catcher Craig Albernaz has been “promoted" from Hudson Valley. 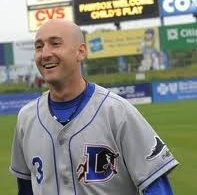 That is, he's taken off the windshirt he's been wearing and can now appear in a full Durham Bulls uniform. Welcome back, Craig. Sorry about the circumstances. The Bulls have no depth whatever left on their bench since all of the players there are nursing an injury of one sort or another. I turned on my radio and it was the bottom of the 4th inning. Matt Torra was having a brilliant night. At the end of the inning not a single Tidean had made it to first base. Driving through the night I had to crank up the radio (reception of AM620 more than a few miles from their tower is crappy) and I discovered that not only was Torra having a great night but the Bulls were ahead 2-0. The reception faded away for a while. When it came back it was the bottom of the 5th and the bases were loaded. Not long after that the Tides picked up four runs. That was all, but it was enough to lose. Too bad, because Torra put in about the best single game performance of any Bulls pitcher this year. But lacking any run support it wasn’t enough. One game oddity was Jeff Salazar leaving the game before taking the field in the 5th. Jesus Feliciano took his place. No explanation was given for his departure. Today is the Bulls first day off this season. They need it. 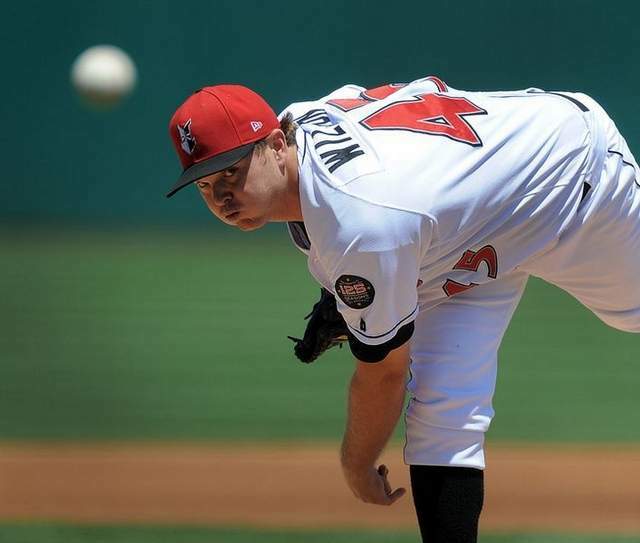 They are home for ten games; four against Pirates affiliate the Indianapolis Indians; four against Reds affiliate the Louisville Bats; and two games against these Norfolk Tides. Charlie Montoyo is reportedly going to use the day off to reset his pitching rotation and put his four starters in sequence. Maybe he’s hoping that by the end of the sequence (Torres, Archer, Cobb, Torra) he’ll have a fifth starter. That would be nice. The Bulls have had a full five-man rotation for only the first five games of this this season. It would not the complete answer to the Bulls problems, since even the four starters they have aren’t doing all that well, but it sure would help. Why has this season started so badly? Well I’ve commented on that at good bit already. For another look, see what Adam Sobsey has to say over at Indy Week. Wool E. Bull has started a video blog. Scorekeeping. Now that the Bulls are back home it’s time to put together my gameday stuff, which includes a scorebook. I’m not all that obsessive about keeping a scorecard. (At least I don’t think so. My wife might not agree.) But it really does help me keep track of what has happened in the game. Patrick Kinas does a good job, but I like being able to look back as the game goes on and it gives me a record to look at for this blog. There’s as many approaches to scorekeeping as there are folks who keep track. See this [Thanks for the tip, DRR] for some examples. I like the Reisner system, but admit that it takes a bit of getting used to. I’ve tried a couple of iPod/iPad systems and they are pretty slick, but, for me, they distract from the game in front of me. As mentioned yesterday, one of the teams playing last night was going to break a losing streak. It wasn’t the Bulls. Is there some light at all? Maybe. Careful reader Chris D has run some numbers for us that are interesting. In this table are the historic (that is, their minor league) OPSs of the Bulls lineup minus new guys Reid Brignac and Stephen Vogt (who had four bases stolen off him and his pitchers while catching just one, but who’s counting?). What jumps out is that all but three players are well below what they’ve done in the past. A couple are down by very substantial margins. If you’re a stats geek at all, regression to the mean would tell you that things just have to get better. Unfortunately, it doesn’t tell you when they will get better. 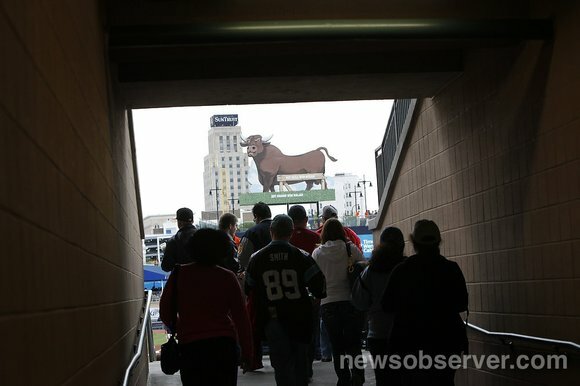 The Bulls are playing at Harbor Park, the main topic of an Adam Sobsey piece last August (scroll down), and reviewed here and here on other websites. The Bulls want you to improve on the look of the Blue Monster. The stats guys over at DRays Bay have taken a closer look at Hideki Matsui, but the Rays have yet to confirm the deal. If these two games had been played last night at the DBAP it would have been really miserable for us. Those of you from around here know that last evening was particularly cold and damp. I was happy not to be at the ballpark. New guy Stephen Vogt got his first hits of 2012, as DH in game 2. He also caught the first game. New guy Reid Brignac played in game 2, at shortstop, and got a hit. Chris Archer and Ryan Reid had decent starts. Reid is emerging as a key figure on the Bulls pitching staff. New guy Lance Pendleton made his first appearance and picked up his first loss. Over the two games Bulls got 11 hits (10 singles, 1 double) but only scored 1 run. The Red Sox scored 9 runs on 15 hits (4 doubles and a homer). The Bulls are playing the Norfolk Tides tonight. The Tides have lost the last 6 games in a row. The Bulls have lost their last 8. Somebody’s going to have their streak broken! Hedeki Matsui (stats) will likely be wearing a Bulls uniform in a couple of weeks, if various reports are accurate. Will that bring some nostaligic Yankee fans to the DBAP. Why not? If you’re into trivia, Matsui has only played in 5 American minor league games in his career (rehab games while a Yankee) He is expected to go to Port Charlotte to get in shape, then show up in Durham. If you missed it, Tim Beckham went on the 7-day DL, making room on the roster for Brignac. Just putting the decision off? Today’s game (Sunday, April 22) was rained out. The Bulls and the Red Sox are to play a double header starting at 5:00 pm tomorrow. Most likely these will be 7-inning games. Reports say that Ryan Reid is scheduled to start the first game and Chris Archer the second one. Very rarely do I guess right when it comes to the business of baseball. But I did the other day. I think I may have sprained an elbow patting myself on the back regarding the latest transaction: Craig Albernaz has been assigned to the Hudson Valley Renegades to make room for Stephen Vogt. Now I wonder if I’ll be right about O’Malley? 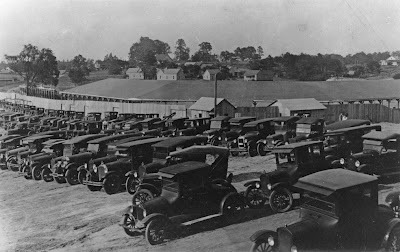 Boy has it been a long time since we’ve been able to go to a ballgame at the DBAP, much less the old DAP. And today’s game has been postponed due to rain in Rhode Island (how’s that for alliteration?). 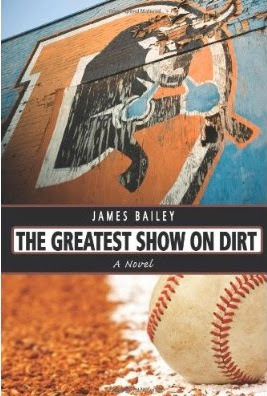 Here’s a modest proposal: Spend a couple of hours with James Bailey’s recently published novel, The Greatest Show on Dirt. Mostly a coming-of-age/love story, what distinguished the book for me was its setting, the old Durham Athletic Park in the early 90’s. I like (but never loved) the DAP and I don’t understand at all the mechanics of putting on a baseball game. That made Greatest Show on Dirt something of a twofer for me, I learned something about both. And reading what it was like to actually work at the DAP was fun. As mentioned, this is mostly a coming of age story, so don’t expect insights into the nuts and bolts of minor league baseball. That’s just the background. But it was interesting enough background to keep my attention, particularly since Bailey writes from personal experience as an employee in the early 90’s. Currently on the shelf at The Regulator Bookshop in Durham, possibly available at other bookstores in the area. Does not show up in the Wake or Durham County libraries. The Bulls bats came alive in Friday's game with 13 hits. Craig Albernaz got his first hit of the season; Brandon Guyer got a home run; even Juan Miranda got two hits. There were moments, such as the top of the 5th inning when the Bulls scored two runs to go ahead 9-6, when things were really looking good. But that was before PawSox DH Mauro Gomez hit his second home run of the game in the bottom of the 5th; the PawSox picked up another run in the 6th; Alex Hassan hit a grand slam in the 7th; and Will Middlebrooks hit a three-run homer in the bottom of the 8th. To summarize, Durham pitchers gave up five, count ‘em, five home runs. So, let’s go on to this afternoon’s game with Alex Torres on the mound. In the first inning Mauro Gomez hit another home run and Middlebrooks hit one in the 2nd. But, hey, that’s only three runs and Alex Torres hasn’t walked anyone. Wait a minute, in the 3rd, Alex Torres’ first 13 pitches include 12 balls. That would be three walks. That is, the bases were loaded by the time before he’d thrown his second strike. Still, he got out of the inning with only one more run scored. So let’s fast forward to the 6th when the Bulls scored 4 runs and went into the bottom of the inning behind only 4-6. Dane De La Rosa come to the mound with runners on first and second, one out. They both scored, plus one that he put on base. 4-9 by the end of the inning. Ten days ago Bulls starters had an ERA of 2.57, not bad, the relievers a not very good 5.29, and the team was at 3.79 overall. Today the numbers are 5.94/6.03/5.98. Awful, awful, awful. New guy Lance Pendleton [Update: Or maybe Ryan Reid] may get the start tomorrow. We know very little about him, but what have we got to lose? McCoy Stadium is apparently one of the good places to watch a ball game. See reviews here, here, and here. Former Durham Bull Jon Weber has signed with the Winnipeg Goldeyes of the American Association. I can't bring myself to write anything about last night's disaster yet and today's game doesn't look much better with Torres leading off the 3rd inning with 3 BBs and giving up home runs in the 1st and 2nd. So, let's just talk about Stephen Vogt and Reid Brignac. Reid Brignac came up through the Rays system playing shortstop including two seasons with the Bulls (2008-2009) when he had decent hitting numbers. Our comments on his 2009 season with the Bulls and Rays are here. With the Rays in 2010 he split time between 2B and SS and put up decent numbers. 2011 was not good for Reid. He was sort of platooned at SS and hit only .193. He visited with the Bulls to try to sort out his hitting. He played in 11 games mostly in August, but did not show much punch at the bat. So far this year with the Rays his BA is down at .118. We've written a good bit about Stephen Vogt. He has not played in a Bulls uniform this year. What will happen when these guys show up? Well, the Bulls now have 12 position players, so two will have to go somewhere. We’ll know soon enough who will go where, but here’s both a couple of guesses and a wish. With four pretty good middle infielders (Brignac, Beckham, Rhymes, and O’Malley) you have to figure that the youngster (O’Malley) will be heading back to Montgomery. But there could be a delay if Beckham were to go on the DL. Beckham hasn’t played the last two games. Who goes off the bus for Vogt? My guess is that Craig Albernaz will go to Hudson Valley and Vogt will focus on his catching skills. Note: Through some kind of mysterious rule manipulation, Bulls players will go on and off the Hudson Valley roster (a Tampa Bay Rays short-season team) during the year. What that means is that they cannot play in a Bulls game, but can usually be seen sitting on bench, warming up pitchers, warming up as if they are going to pitch, etc. In general, they will be wearing a sweatshirt or windshirt over their Bulls jerseys. Prior to the 2011 season I got to ask Albernaz if he had ever been to Hudson Valley. He said that he had not. What should happen? I wish they'd take a close look at the fine print in Juan Miranda’s contract. 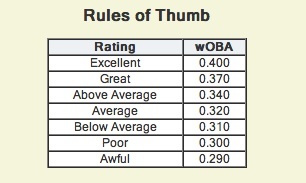 His wOBA after 12 games is .281, below “awful” on the wOBA scale (.290). Will he get better as the season goes along? Don’t know, but certainly the Rays just bought a first baseman and must be happy with their 1B situation. Miranda seems to be pretty much dead weight with the Bulls, so far. So maybe release Miranda and keep Albernaz on the roster. What a refreshing start to a game. For a change, the Bulls had a non-struggling starting pitcher on the mound. After a long, long, long layoff (9 days), courtesy of our great good friends down in St. Petersburg, Alex Cobb was back in a Durham uniform. His line doesn’t look all that impressive, especially with the 6 walks he gave up. But as near as I could tell from the radio, he was doing just fine until he walked the first batter in the 7th. At that point, with 90 pitches thrown, Dane De La Rosa came in. Even then things looked OK. De La Rosa struck out the first two batters he faced even though Cobb’s runner made it to second base on a steal. But then he walked the bases loaded and John Gaub came in and gave up a bases clearing double and then another double. If you are into statistical trivia, of the four runs scored in the 7th inning, the first run was charged to Cobb, then next two to De La Rosa, and the last to Gaub. As long as I’m feeling grumpy, let me point out that the Bulls haven’t hit a single home run on this road trip. If fact, the Bulls last homer was back on April 9, ten games ago, by Brandon Guyer. Off to Pawtucket, Rhode Island. This trip is half over! 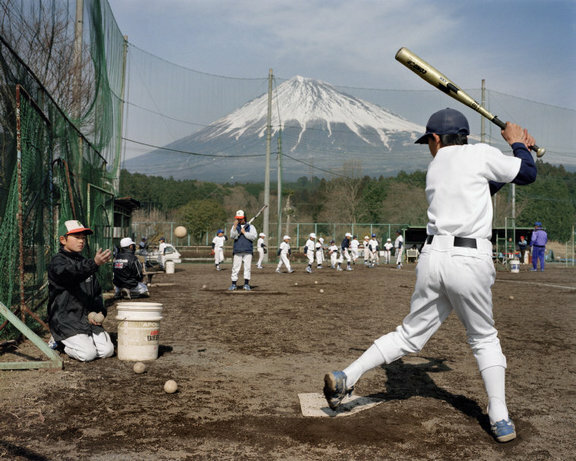 If you want to see some beautiful, beautiful baseball photos by the Magnum service, take a look at these. ( I will sneak one in at the bottom. I can always delete it later). The Rays have claimed a first baseman, Brandon Allen, off waivers and outfielder, former Bulls shortstop, B.J. Upton, is due to come off of the disabled list. Even with the Rays skill at manipulating the roster rules, the likelihood is that two position players are going to have to get off the 25-man roster bus. Stephen Vogt thinks he may be one of them. The other? By the end of this trip, the Bulls will have put on roughly 2,100 miles. If they had spent it all on the bus that would be something like 38 hours just on the road. This is being reported in a couple of places, but lets just go with Rays Prospect’s report since it has more details and stats. 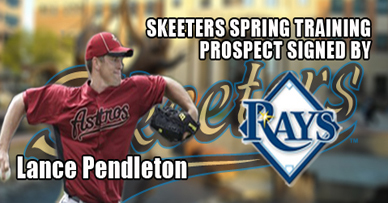 Lance Pendleton, a veteran right handed starter and reliever has been signed by the Rays and likely to be headed to Durham. The most recent version of the Bulls roster still shows Bryan Augenstein on the 7-day DL, but a roster that shows Alex Cobb twice isn’t likely to be trusted. The Bulls are in obvious need of a starting pitcher and it looks like Pendleton could be the guy. Pendleton’s Manager at the independent Atlantic League Sugarland Skeeters, Gary Gaetti, should be a familiar name to Bulls fans. He was the Bulls hitting coach for Charlie Montoyo prior to Dave Myers coming on board. Is there a connection there? Try as I might, I just can’t get a handle on this team yet. I did some yard work during yesterday’s game and it sure sounded like the pitchers were keeping things under control, but the Bulls could not put anything together. Meanwhile, former Bull Ray Olmedo, who’d come into the game hitting less than .100, got 2 doubles, a single and scored a run. In today’s game Chris Archer put in his second troublesome start. I’m wondering if all the pre-season attention and adulation has been a distraction. He is essentially the face of the 2012 Bulls. See, for example, this recent piece about him on the Bulls website. In 12 innings he’s given up 14 runs and 13 walks. As with Torres, you know he’s going to get better, but when? Let’s give some time to the surprise (for me) of the year, Leslie Anderson. I had not been impressed with Mr. Anderson in the two years he’s spent time on the Bulls roster. I know he was a huge star in Cuba and I certainly admire his courage in leaving the island for an uncertain future in the US. But it seemed to me that he simply wasn’t adjusting and at 30 years of age, we really couldn’t expect too much. Guess what? No surprise, I was wrong. In 11 games so far and he’s the International League’s leading batter with a .465/.500/.558 line. He isn’t hitting for power. His 20 hits include only 4 doubles. (Note: it says something about this year’s Bulls that with those four doubles, Anderson leads the Bulls in slugging at .558) True to his usual form, he certainly isn’t looking for a walk. He’s only drawn four walks this year (two of them today). Now, if his slightly younger team mate, also left-handed, also from Cuba, also playing first base, Juan Miranda, could join in with him. The Bulls are playing in Knights Stadium. This is another location that the folks that rate stadium don’t much like. See here and here for reviews. The underlying issue is apparently that for several years city politics has kept the Knights from moving into the downtown. I wonder what’s happened to Stephen Vogt? He was called up to the Rays just before the season opened in Durham, possibly because the Rays didn’t want to give up a spot on the 40-man to Jeff Salazar. Salazar is getting plenty of playing time with the Bulls and if he hasn’t been a stunning performer, he has hit for some power and stolen a couple of bases. Meanwhile Vogt is mostly riding the bench with an occasional dh/ph opportunity the Rays. Unfortunately he has yet to get his first big league hit or spend much on the playing field. Too bad, we really like him. Maybe when BJ Upton returns we'll get him back here where he can get some playing time. This road trip is turning into some kind of ugly. So far the Bulls have scored 15 runs to their opponent’s 39. Charlie Montoyo and pitching coach Neil Allen are famously intolerant of bases on balls, so last night’s 12 freebies must have them upset. Alexander Torres we have written about earlier. Last night wasn’t the turnaround we’d hoped for. Maybe next time out. Josh Leuke’s first appearance as a Bull showed a lot of rust. Unless I’m misreading the stats, he only made two appearances with the Rays, April 7 and April 13, 2⅓ innings, 9 hits, 7 ER. Last night’s inning, 4 hits, 5 ER, wasn’t good either. But his record is much, much better than that. We can hope. Good news? Only 1300 fans on hand. Does Charlotte have a problem there? But now the Bulls have these two 11:00 am starts. Gonna get weirder before it gets better. Alex Cobb is coming back; Brendan Gomes went up. Good news for both the players and the Bulls. I’m sure Mr. Cobb wouldn’t agree, but the Bulls really need a starting pitcher and I hope he can put up with us for at least a month or so. Every been curious about the knuckleball? A fan seated near me the other night pointed me towards this terrific interview and podcast with the Mets pitcher R.A. Dickey. He just might be the last knuckleballer in the game. Very interesting guy to listen to. Yet another amazing image by Flip Flop Fly Ball’s Craig Robinson. This one in Smithsonian Magazine. 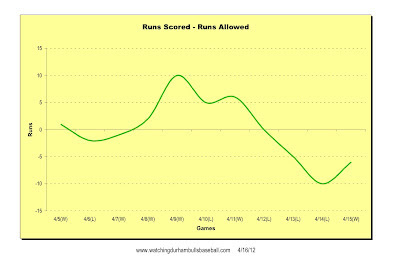 He charts the average number of runs per team per game per year over the history of baseball. And just for fun he throws in just how much further baseball players are going to have to run to get to the moon. Time to roll out WDBB’s first batch of charts. As a general statement, but especially this early in the season, the small sample size means that these are not particularly useful, but still fun to look at. In all cases, clicking on the chart will give you a larger (and more legible) version of the chart. 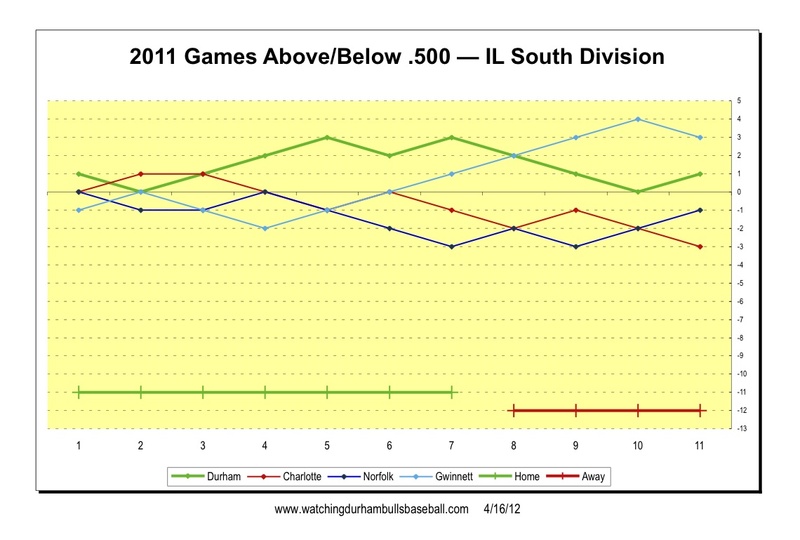 First is just a look at how the Bulls are doing in the South Division of the International League. As you can see, the Bulls just got above .500 on the season and are headed for Charlotte, who are two games behind the Bulls. 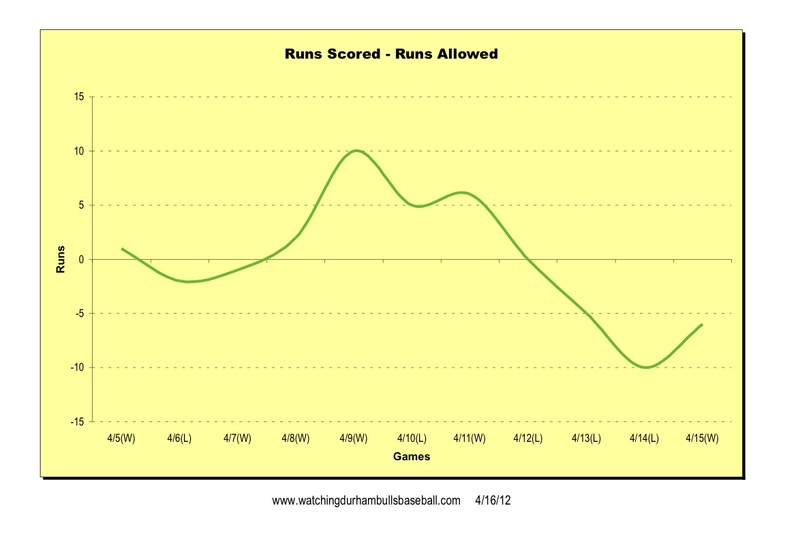 This one is a running total of the runs scored by the Bulls minus the runs scored against them. 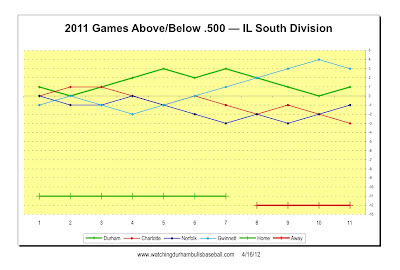 This is something of a visual representation of Bill James’ “Pythagorean Expectation”. That in turn is the oddly true idea you can use runs scored and runs allowed to estimate how many games a team “should” have won. The Bulls current Pythagorean Expectation is 5-6, while their actual is 6-5. So, the Bulls are doing a good bit better than their “expectation”. But remember the small sample size warning. 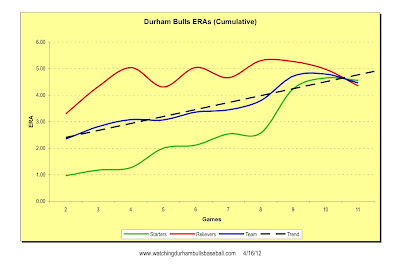 Lastly a look at how our pitchers are doing as measured by cumulative ERA. Again, the small sample size will lead to a lot of variation at this point in the season. The oddity is how the reliever and starter lines are coming into synch. But that’s likely to be an artifact of the sample size as well. The last time Jim Paduch pitched a game for the Bulls, the Bulls hit five home runs and scored ten runs in just the first two innings of the game (July 21, 2011). By the end of the game the Bulls had hit two more home runs and scored a total of 18 runs against the Rochester Red Wings. Paduch had joined the Bulls from Montgomery for the day and went back the next. The results this time weren’t quite as spectacular, but the Bulls did get out of a 3-game losing streak and that was great to see. Paduch held the Braves to one run in his three innings and a combination of relievers Reid, Ramos, Sanchez and Gaub finished out the game. As with the last time, after the game Paduch went back to Montgomery. The Bulls didn’t really start hitting until the 5th, and they had some help with a Braves pitcher throwing error. Similarly in the 6th another fielding error helped the Bulls out. This is not a big inning team. Unlike the seven home runs the Bulls hit on that one day last July, the Bulls have only hit four homers in 11 games this year (the least in the league) and Nevin Ashley’s double yesterday was only the Bulls 16th (Just barely ahead of Louisville and Lehigh Valley). That means, obviously, that pitching is even more important. And that’s in turmoil. Off to Charlotte for a game tonight. Well, not really Charlotte. Not even North Carolina. The Charlotte Knights play baseball in Fort Mill, South Carolina. Alex Torres is up to pitch. Will we be seeing some orderliness reappear in the pitching lineup? I don’t think so. Paduch and reliever Adam Liberatore have been sent back to Montgomery. If De La Rosa and Lueke show up the roster will fill up, even if there still will be only three starting pitchers in the crowd. Chris Gimenez went right into the lineup for the Rays and got a hit in his second at bat in the Rays loss to the Red Sox. Here’s a bit of background on his cringe-inducing injury (Wonder why a local reporter could not have gotten that story? Not trying?). But he also took some heat for not being able to get a bunt down. Panic might not be precisely the right word, but close enough. After all, the Rays have just lost four out of their last five games, some by pretty humiliating differences. So, just a day after calling up Dane De La Rosa, they’re sending him back. They’ve called up Alex Cobb, who was due to pitch for the Bulls today, and catcher Chris Gimenez, who came off the DL today (or was it yesterday?). So, the Bulls are down to three starting pitchers. At a guess we’ll see another “start by committee” today. Maybe Ryan Reid leading off? If the idea was to save Gomes and Ramos for later, what does it mean if they are needed for long relief with the Bulls now? Shall we just move Albernaz to the bullpen and call up yet another catcher? I can’t bring myself to write about last night’s disaster, so I won’t. Let’s talk about all the transactions that have happened over the last several hours (and my guess is that there’s more to come). RHP Josh Lueke has been sent to the Bulls from the Rays. Leuke actually started the season on the Bulls roster, but, as far as I know, he never put on a uniform. He’s had just two appearances with the Rays, in relief, 2⅓ innings, 9 hits, 7 earned runs, you do the math (OK, I will, that’s an ERA of 27.00). He is without a doubt a better player than that. The Rays called up Dane De La Rosa, which confirms that they surely know a lot more about baseball and their players than I do. Just from looking the stats, Dane was the least likely Bulls reliever on the Ray's 40-man roster to be called up. Gomes, Ramos, and Gaun all had better numbers. I like him. Here's hoping he is able to take advantage of the opportunity. RHP Adam Liberatore has been called up from Montgomery. Liberatore is in only his third season of professional baseball and has been used almost exclusively as a reliever. He is not mentioned on the Rays Prospect website, so I guess that we will see what we see. He does not fill the hole made by Bryan Augenstein's trip to the disabled list. Hard to guess what will happen there. I do have to note that Craig Albernaz pitched another scoreless inning last night. Just to get this off on the right foot to all those who remember Pogo: Friday the 13th comes on Friday this month (that would be today)! The 14th pitcher to take the mound for the Durham Bulls in 2012 and the fifth, and arguably the most successful, last night, was ... catcher Craig Albernaz! That’s a hint on how the night went down in Georgia. After pitcher Bryan Augenstein came up with a sore elbow (he's now on the 7-day DL), the Bulls took a “starter by committee” approach with the first pitcher out of the box being former Brave Jhonny Nunez. He was followed by Ryan Reid, Romulo Sanchez, John Gaub, and Albernaz. Pretty ugly all around, with only Gaub and Albernaz having scoreless outings. 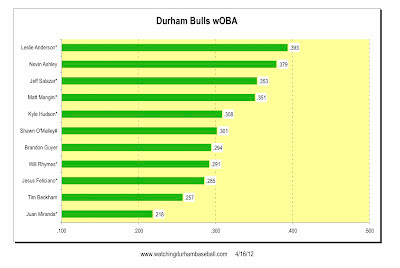 None of the Bulls did very well at bat and Beckham (2 errors) and Miranda (3 errors) were awful in the field. It is a great example of how a minor league ballpark is now more of a playground for spoiled suburban kids than it is a place to watch a baseball game. Former Bull Jeremy Hellickson is reported to be OK.
Rays catcher (and former Bull) Jose Lobaton is reported to have a hurt shoulder. That could shake up some rosters, including the Bulls. Slightly surprised that Robinson Chirinos isn’t included in the speculation. Former Bull Dirk Hayhurst adds in his two cents to the Guillen controversy. Johnny Damon signing with the Indians means that there’s one more guy in the way of former Bull Russ Canzler getting to the big leagues. Too bad. I know that Alexander Torres is supposed to be a great prospect, but two starts into this season I’m not so sure. Now obviously this is just a look from very far off in the stands, but today’s 4 BB and 6 Ks was vaguely like the 3 BB and 7 Ks of his first start. And then there’s the 94 pitches in 4 1/3 innings on Friday and 96 pitches over 5 innings today. And let's not forget the wild pitch and hit by pitch today. Yes, the Knights only scored three runs, but one of those runs came from a walk and another came when a runner got in position on a wild pitch. I’m sure I’m not the only one who’s worried. This looks very much like the Torres of 2011. Don’t get me wrong. I like having him in the rotation, but I’d be even happier if the young man were showing greater progress. Meanwhile, the Bulls jumped on the Knights’ starter for three runs before the first out and four runs before the 1st inning was over. Almost enough to win the game although enough runs kept sneaking across to make the game very, very close until the end. It turned out that the key play came on a near-routine fly ball by Brandon Guyer that was dropped by the Knights’ right fielder in the 7th allowing a run to score. Very unusually for the DBAP, the wind was whipping through the park all day. Did the Knights’ Shelton misjudge the ball or was he too intent on preventing the runner tagging up from third base? Impossible to tell, but that extra run made all the difference. Very successful opening home stand. Too bad about this awful upcoming road trip. Fourteen games in 15 days in four different cities. That’s outlandishly bad scheduling. Broadcaster Patrick Kinas reported that pitcher Bryan Augenstein has a sore elbow and that reliever Jhonny Nunez will get tomorrow’s start down in Gwinnett County. Chris Richard was in the ballpark for what was reported to be his last time. He’s moving to California. Former Bull Jeremy Hellickson was hit by a batted ball during warm ups today in Chicago. Reported to be OK, but taken to hospital. We’ve got another game here in just a few minutes, so I’ll be brief. The Bulls have a bunch of left-handed batters in the line-up this year — five of nine last night. Two of the three players on the bench were lefties. So here they were facing their first left-handed starter of the year, 32 year-old Eric Stultz, who was followed by left-handed Donnie Veal. Except for the gifts, 5 walks, the Bulls did not do well. They only managed two hits off of Stultz and one off of Veal, all singles. Not that the Bulls didn’t have a couple of opportunities to score. On three separate occasions the Bulls had runners in scoring position. But those runners were mostly there as a result of gifts and when the Knights pitchers stopped giving, the Bulls stopped getting on base. Alex Cobb went a full seven innings and only gave up four hits, but they hit him pretty hard. All the hits were doubles. On some nights, for some pitchers, you get the feeling that manager Charlie Montoyo wants to see what the pitcher's made of. In the 8th Marquis Fleming was in real trouble. After getting an out he gave up a home run, walked the next batter, then a single and another walk. After a wild pitch that let a run score, he was ordered to walk Dan Johnson to re-load the bases. At another time and another place he would have been able to look over to the bullpen and see someone warming up. Not last night. Very quiet over there. He was on his own. He got a double play to end the inning. In the next inning he gave Ray Olmedo his first hit of the year and faced five more batters, giving up one more run. Tough night for the young man. Really enjoying Scott Pose’s commentary on the radio broadcasts. Nice to have him back. I miss Doc Watson’s rendition of “Take Me Out to the Ballgame” for the 7th inning stretch. That was fun. Beautiful day. Great baseball. Bulls win. The story at the links is pitcher Chris Archer, and he did do quite well. He’s going to be fun to watch this year. He held the Braves to just one run, a homer by Ernesto Mejia to start the 2nd. His 8 strikeouts ties him with Augenstein and Cobb. Note: how about that, three out of four Durham starters begin the season with 8 K’s, and the fourth (Torres) had 7? Very impressive even if it is the beginning of the season. I like the youngster on the team, infielder Shawn O’Malley. This is his first time in AAA and he’s doing just fine. He got his first hit yesterday, a big home run over the Blue Monster in the 6th. As important, however, was his bases-loaded sacrifice fly in the 2nd that pushed across the first of five runs in that inning. He started at shortstop yesterday, giving Tim Beckham his first day off. Given the way Charlie Montoyo like to run his team, what we are likely to see is O’Malley at shortstop or second base when Beckham or Rhymes is due a day off, maybe a start or two at third over the year, and possibly a stint in the outfield. Leslie Anderson is starting the year on a roll. He picked up two more hits (singles) yesterday and is batting .500 in 12 ABs. He’s had just the one start at 1B, while his counterpart at that position, Juan Miranda, is waiting for his first hit. It will come, but it’s becoming frustrating to watch. Big day today for folks who follow the Bulls from year to year. Dan Johnson and Ray Olmedo come to town wearing Charlotte Knights uniforms. The Knights are 2-2 on the season. Johnson has played in all four games and hitting .333 in 12 AB. Olmedo is waiting for his first hit in 11 ABs. While you’re waiting for the Bulls front office to fix their site, here’s a link to the Bulls roster. I’ve been using the Bulls app. After a slightly rough start, it’s been working very well. Not really useful for listening to the game while at the game (a bit of a delay as the electrons work their way through cyberspace), works fine if you’re not at the park. I haven’t tried the LiveShare app. Broadcaster Patrick Kinas reported that pitcher Romulo Sanchez is OK after taking that line drive off his ankle on Saturday. Could be back very soon. Who reading this remembers Joel Guzman? Well, he’s still playing ball, now for the Pensacola Blue Wahoos, and he hit a home run yesterday that helped them beat the Montgomery Biscuits. I can still remember him hitting the biggest homer I've seen at the DBAP. It rattled around inside the framework of the under construction Diamond View II, at least a floor, possible two floors, above what's now the Tobacco Road cafe. Last we heard he was in the Baltimore system. Now looks like he's with the Reds after a year in Japan. One of WDBB's favorite ballplayers, catcher Craig Albernaz, is coming over from Montgomery to the Bulls for a couple of days. Catcher Chris Gimenez has apparently pulled a muscle and has been place on the seven day disabled list. Hope Craig gets into the game and has some fun while he's here. We'll have fun watching him. Talk about ups and downs. The Bulls weren't exactly cruising, but at the top of the 9th we felt comfortable enough to start heading for the gate. New guy Romulo Sanchez had a good rep, so even if the Bulls were only up by one run, it seemed as if the game was in hand. A walk, a hit batter, a sacrifice, and a single later, Mr. Sanchez was being helped off the field and the Bulls were down by one run with Braves on the corners. Cesar Ramos came in and gave up a walk, but got out of the inning on a double play. But with the score now 5-4 it sure looked like the Bulls were, at best, heading for another extra inning game. Not so fast. Tim Beckham draws his second walk of the night to lead off the 9th. Brandon Guyer moves him to second. Matt Mangini singles Beckham in and is replaced by pinch runner Jesus Feliciano. Leslie Anderson's second double of the evening brings Feliciano around for the win. This was the second come from behind win in the first three games. There's nothing in Bryan Augenstein's recent history to show him to be a starting pitcher. In 2011, for example, he was in 26 AAA games, all but one as a reliever. And yet, after a tricky first inning when his own fielding error set up a run, he had a very impressive six innings. He finished out the 6th by striking out the side — 8 Ks, 0 walks, 1 ER. Of his 80 pitches, he threw 61 for strikes. Recent arrival John Gaub didn't look all that great, but Brandon Gomes kept things on track until Sanchez' troubles in the 9th. In the meantime, the Bulls collected their first extra base hits of the year. Brandon Guyer and Jeff Salazar hit home runs, Chris Gimenez had a double and, as mentioned, Leslie Anderson had two. We saw Will Rhymes at third base last night and Shawn O'Malley at second base. O'Malley did just fine. Notable was a couple of heads up moments covering first base. Anderson showed some flash with the glove and at bat. Trying to work his way back to the 40-man? At the time of this writing, no news regarding Sanchez's injury. The Braves Julio Teheran looked nothing like the pitcher we saw last year. The Bulls got to him by the 2nd inning, forcing the Braves once again deep into their bullpen. Beautiful late afternoon game at the DBAP. Chris Archer tomorrow. The DBAP comes in as #2 in AAA according to a new rating. The Biscuits lost to the Wahoos 4-5. After all the demolition, big changes underneath the stands. And changes coming on the outside. Josh Leuke, who sort of started the years with the Bulls, did not have an auspicious beginning as a Tampa Bay Ray reliever: 1 1/3 inning, gave up 3 runs on 3 hits with 2 walks. Of all the relief pitchers on this year's Durham Bulls roster, the last guy I'd expect to have trouble is Dane De La Rosa, but that's what happened last night. Things unraveled for him in the top of the 11th. Of course, if things had gone better he would not have been on the mound in the 11th inning. The Bulls loaded the bases in the 5th and again in the 9th, but could not get a run across. Both times young Tim Beckham was the goat. However, Mr. Beckham has at least gotten a couple of hits in these two games. The Bulls have five batters (out of nine position players) waiting for their first hit — Miranda, Guyer, Feliciano, Salazar, and O'Malley. Not one Bull has gotten an extra base hit. In the long run, however, this could be a team that's death on right-hand pitchers. Last night's starting lineup had six players batting left-handed. Alex Torres had the start last night and for three innings he looked terrific. And then he started throwing a lot of pitches per batter, walking two of them and the fifth began no better. I haven't dusted off my efficiency stat for this year yet, but his 94 pitches to 18 batters (5.2) won't look good. On the other hand, he did get 7 K's. For a more in-depth look, see the Indy Week article at link above. We got to see Marquis Fleming for the first time. His brief visit to the Bulls last year was at an away game. He's going to be fun to watch. Kyle Hudson is 6 for 8, all singles. He is another player that will be fun to watch this year. Hudson was acquired from the Rangers just few days ago, but he came up through the Baltimore system and spent some time with the Norfolk Tides last year. To be honest, I don't recall him. But looking through some old scoresheets I see he was a leadoff batter in a game last August and struck out a lot. He's young. He's fast. Not sure why the Rangers let him go except that they owed the Rays a ballplayer from an earlier deal. The Rays won their opener in walkoff fashion beating the Yankees 7-6. Recent Bull Stephen Vogt got his first major league at-bat, pinch-hitting for former Bull Elliot Johnson in the 8th inning. He struck out. I'm often asked how much AAA ballplayers make. The answer is, usually, "I don't know." But if Rays Index is correct, a player on the Rays 40-man is making at least $78,000. The Biscuits beat the Blue Wahoos (the former Mudcats — what kind of name is Blue Wahoos?) 9-3 last night. The weather was cold and ugly. The baseball had its good and not so good moments. Nevertheless, what seemed to be one of the longest and oddest winters ever is over. Baseball is back. First impressions of the team are pretty positive. Will Rhymes brought a lot to the game and Chris Gimenez is looking to be a terrific catcher (note his interview on WRAL yesterday) A commenter noted that Shawn O'Malley was Tampa Bay's Organization Baserunner of the Year a couple of years ago. He missed some time with a shoulder injury, but did just fine last night after coming in to run for Mangini and then playing the last several innings. Looks like I might have to eat my words regarding the lack of speed on this team. Gwinnett used nine pitchers, including former Bull Adam Russell. I thought he would have stuck with Atlanta. Guess not. The Bulls used seven pitchers and, except for the home run given up by Romulo Sanchez Cesar Ramos, they looked just fine. Alex Cobb, coming off his surgery, looked particularly good. In previous seasons, Tampa Bay has limited starters to 75 pitches. Cobb went five full innings and 89 pitches, so I'm guessing that they are trusting Neil Allens' judgment. My first impressions of the new broadcaster Patrick Kinas are positive. Keeps his (and our) heads in the game. Has obviously been talking to the players a lot. Very knowledgeable on minor league baseball. Kept his voice for four hours. Pretty good. The Rays pulled the trigger on Bulls pitcher Josh Lueke's assignment and he is on his way (or already there) to St. Petersburg. The Rays claimed a left-handed pitcher from the Cubs organization, John Gaub, and put him on the 40-man. Pretty sure he will end up in Durham in the next couple of days. Local TV station WRAL spent a lot of time at the DBAP yesterday. See here and here. The Durham Bulls did not make Baseball America's Top 10 minor league team list, and neither did any other International League team. Working on my checklist: scorecard, radio (tuned to 620), batteries, tickets, parking pass, what else? In the meantime more preseason pieces. Stacy Long over Biscuit Crumbs has the Bulls rotation as Cobb (today), Torres, Augenstein, Archer, and Torra. The Herald-Sun has added two more profiles, both well done, on outfielder Brandon Guyer and reliever Dane De La Rosa. Wonder of wonders! The Raleigh News & Observer has noticed that there's a baseball team in Durham with an opening day piece. Indy Week opens its excellent Bulls coverage with a print and web piece on both the ballpark and the players. The Bulls start the season playing the Gwinnett Braves, the Atlanta Braves AAA team that moved from Richmond, Virginia to Lawrenceville, Georgia a couple of years ago. Todd Redmond, a pitcher we've seen a lot of, will start tonight. Their hot prospect is pitcher Julio Tehran, but outfielder Stefan Gartrell gave Bulls pitching a good bit of trouble last year. Season opening profiles of the Braves here and here. Lastly, just to close out something I've been watching, the last 2011 Bull that I thought had a shot at making a big league team got sent to AAA. Justin Ruggiano, who we saw in the last five seasons here, was a nonroster invitee to the Houston Astros this spring. He is off to Oklahoma City, the Astros AAA team. See you at the DBAP! Oh, by the way, if you're not used to it, parking can be a bit tricky ... maybe come a bit early just in case. 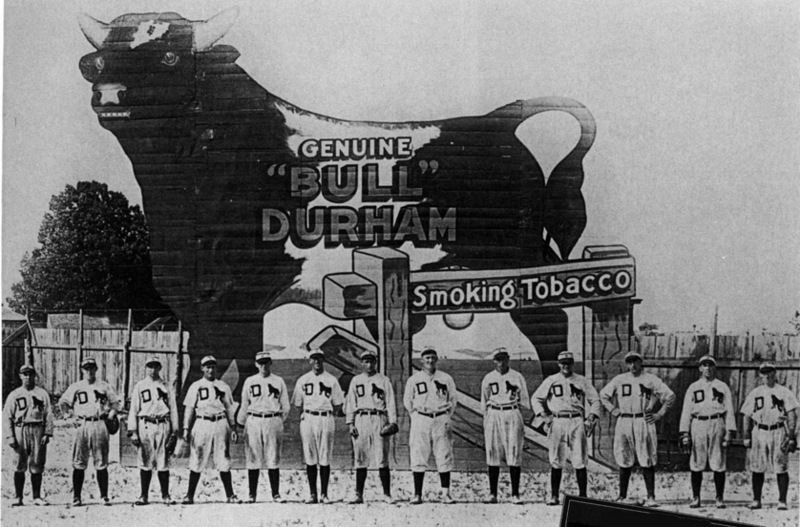 This collection of twelve mostly very experienced ballplayers should serve the Bulls well this year. Defensively they look very good. Base running speed and power? Maybe a problem. We’ll see. The only players with a lot of time with the Bulls last year are Leslie Anderson (121 games) and Brandon Guyer (107 games). Nevin Ashley got in 32 games last year as one of six different catchers who played with the Bulls in 2011. Top prospect Tim Beckham came up in August and got in 24 games at SS. He played some second base in spring training, so we might see him there. He was usually the leadoff hitter. Comments on their play last year is here. That leaves eight guys new to a Durham Bulls roster. However, only Shawn O’Malley is new to AAA baseball. Brandon Guyer is the only position player on the 40-man. The depth of major league experience is substantial. Nine of the 12 players on the Bulls has at least some major league time. Only Leslie Anderson, Shawn O’Malley, and Nevin Ashley do not. Is there a concern? Well, yes. With the exception of Kyle Hudson (26 stolen bases in 2011), none of them has shown anything special in terms of base running speed, although Guyer did steal 16 over 107 games last year. We also have to worry how many are on “opt-out” contracts. An opt-out contract allows a player to leave the team at a specified time if certain conditions haven’t been met (promotion to the active roster or at least the 40-man roster, for example). On the other hand, I have to say that the defensive “diamond”, catcher, SS, 2B, CF looks very good with two solid catchers, three above average middle infielders (Beckham, Rhymes and O’Malley), and Guyer in CF. For a change the infield corners look promising with Mangini and Miranda in place. That’s the first time in many years I’ve been able to say that. Is there some bat pop missing? I’m not sure. Maybe. The starting rotation for any AAA team is frequently in flux. This year won’t be any different. But it sure looks good for the opening round of games. We saw, and wrote about, four of the five starting pitchers last year (see here and here). Of the four, Alex Cobb, Alex Torres, and Matt Torra are very solid guys. We only saw Chris Archer a couple of times so we neither agree nor disagree with the hype around him. Alex Cobb, on the other hand, is for sure the real deal and if Alex Torres ever gets a handle on his control, he is sure to see some big league time this year. Cobb, Torres, and Archer are on the Rays 40-man. New guy Bryan Augenstein has some major league time and has bounced around a bit, most recently in the Cardinals system. His stats show him as spending almost all his time as a reliever, but it appears that the Rays want to look at him as a starter. I think he’s going to be a very interesting ballplayer to watch. As with the starters, most of the relievers have spent some time in a Bulls uniform. Five of the seven on the roster have been with the team. (However, in Marquis Fleming’s case it was only for 2 innings last July. He was the winner of the 2011 Moonlight Graham Award.) Cesar Ramos only had 4 innings, but Ryan Reid had 55, Dane De La Rosa had 70, and Brandon Gomes had 25 before he was called to the Rays. So the only relievers who are complete strangers are Jhonny Nuñez and Romulo Sanchez. We saw Nunez in a Charlotte Knights uniform last year. Sanchez played in Japan last year and has a good bit of AAA time (and a few innings with the Pirates and Yankees). Gomes, De La Rosa, and Ramos are on the Rays 40-man roster. That leaves reliever Josh Leuke, who comes to the Rays system from the Mariners. We assume that he’s to start the season with the Rays, but we don’t know that for sure. 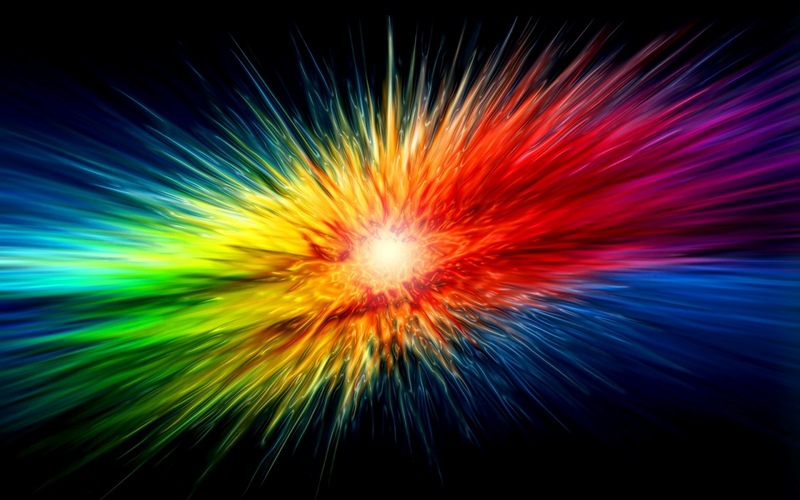 Nor do we know if there could be a ripple effect down through the system. He is on the 40-man, has decent stats, and obviously ready to play in the big leagues.